Two Historic Proofs, One Legendary Tale! The United States National Museum. The Nation's Attic. The Castle. However you choose to refer to it, the Smithsonian Institution is one of the greatest establishments in the United States. But where does this colossus of cultural collections, with 19 different museums and galleries, come from, and what precipitated its creation? The tale is as fascinating as it is revelatory, and it begins nearly 190 years ago. When James Smithson, a wealthy British chemist and mineralist, passed away in 1829, he left his sizable estate to his nephew, Henry James Dickinson. But when Dickinson passed away several years later without an heir, a stipulation in Smithson's will went into effect: all of his assets would go "to the United States of America, to found at Washington, under the name of the Smithsonian Institution, an establishment for the increase and diffusion on knowledge among men." Strangely, Smithson made this bequest even though he had never visited the United States in his lifetime! Despite the mysterious request, though, the British courts sent notice to the United States government of Smithson's final wish. The United States Congress accepted the bequest in 1836, but the money would not be sent for another two years, When the time came for Smithson's estate to be sent across the Atlantic, Congress asked that it be sent in the form of newly struck Gold Sovereigns bearing the profile of the recently-crowned Queen Victoria. The Royal Mint went to work, and soon 104,960 British Gold Sovereigns were loaded on a ship bound for America. After a journey fraught with danger (and several hurricanes), the ship carrying Smithson's bequest arrived on the other side of the Atlantic, where the gold was unloaded and presented to the United States government. However, now that Smithson's estate had arrived in the U.S., who was going to accept foreign coin as payment? The answer was simple -- the gold just needed to be restruck! 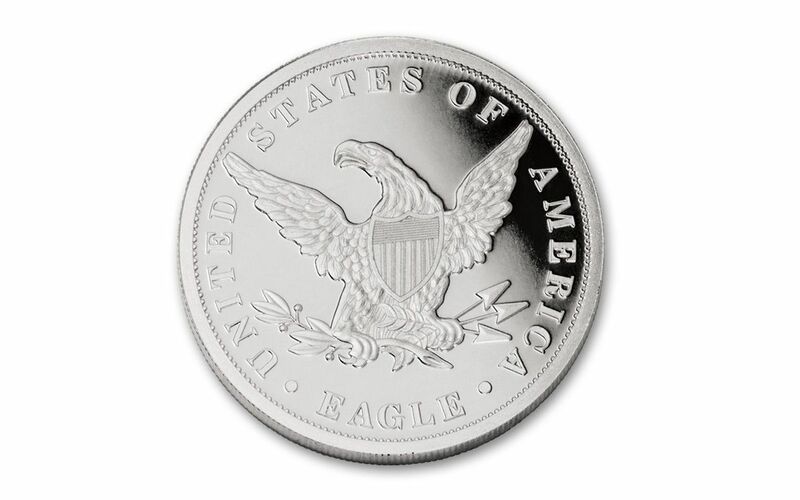 The coinage was shipped to the U.S. Mint in Philadelphia where it was melted down and turned into nearly $508, 320 worth of $10 U.S. "Liberty" Gold Eagles -- more than $11 million in modern money. Using nothing but the interest gained from Smithson's original bequest, a castle-like structure was constructed near the National Mall in Washington, D.C. The Smithsonian Institution was born, and The Castle is still used to this day as the Smithsonian Information Center and the Institution's administrative headquarters. And, thanks to the brilliant minds behind the Smithsonian Institution's founding, operations continued using only the interest gained by the initial bequest and additional capital fundraising campaigns. To this day, it's believed that none of Smithson's original donation has been spent! Now is your chance to add a piece of this incredible true story to your collection. 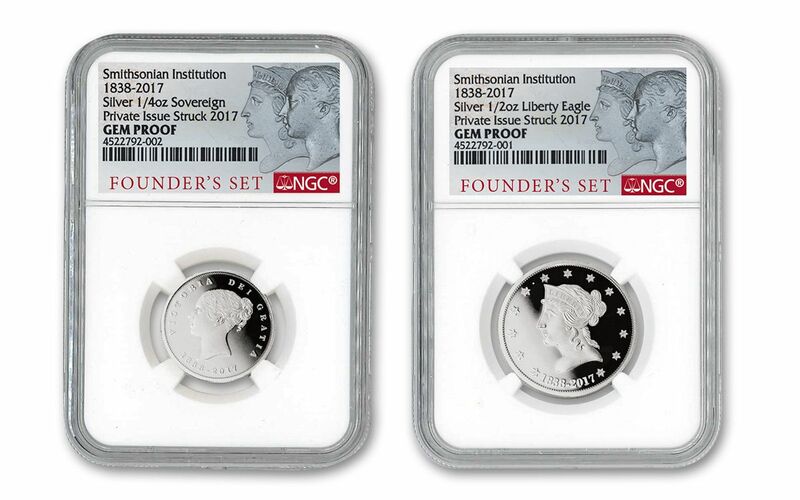 In honor of this legendary tale, the Commonwealth Mint has struck two special dual-dated proofs, modeled after the two coins that made the founding of the Smithsonian Institution possible. 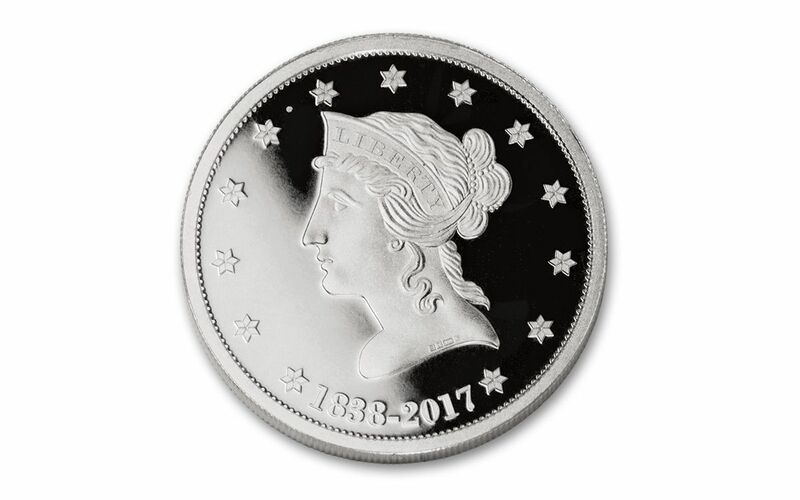 Each comes struck in 99.9% pure silver and features dual dates of 1838, the year that would have graced the British "Victoria" Sovereigns sent across the Atlantic as well as the U.S. Liberty Gold Eagles used to found the Smithsonian Institution, and 2017, the year the proofs were struck. 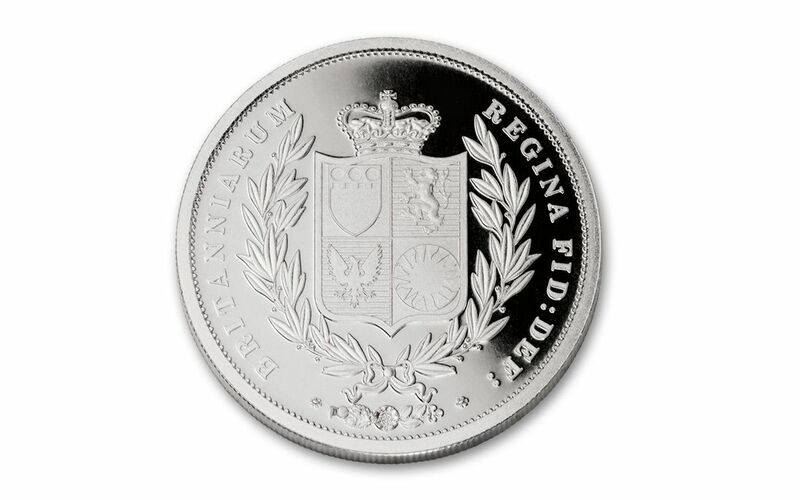 The proof modeled after the British Sovereign even features a special crest on the reverse depicting the Smithson family crest, the lion of Great Britain, the eagle of the United States and the emblem of the Smithsonian Institution -- a wonderful representation of this incredible story. Officially assayed by the Queen's Assay office and approved by the Smithsonian institution, the Smithsonian 1838 Silver Founder's Two-Proof Set comes in a beautiful black lacquered wooden box featuring a pewter engraving of the original Smithsonian castle on top along with a numbered certificate of authenticity. 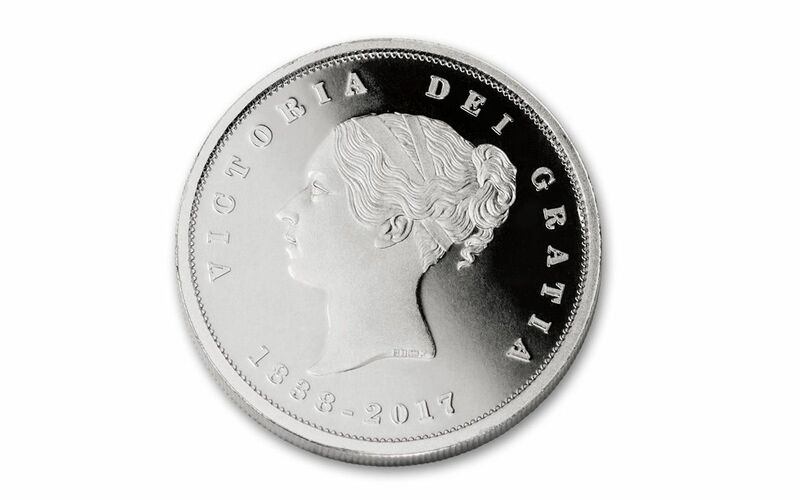 In addition, each will be inspected and graded Gem Proof by Numismatic Guaranty Corporation (NGC), certifying that each proof is the product of a superb strike, placing them firmly among the elite of the run. Your proofs will also be sonically sealed in individual acrylic cases -- giving you the best in protection while granting clear sightlines into every beautiful detail. 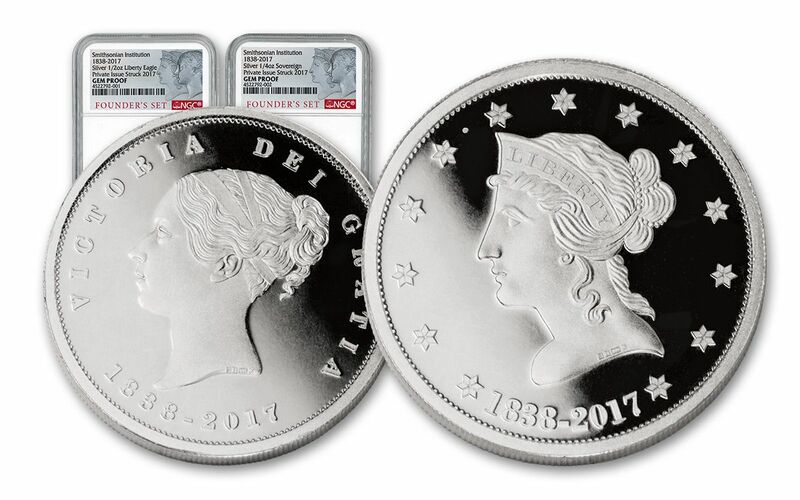 Finally, all of your proofs' unique characteristics will be described in detail on each acrylic case's special "Founder's Set" label, specially-designed for this occasion! Only a very limited number of these sets will be minted and released. Don't miss out on this incredible opportunity to bring this 190-year-old story home. Order yours today!